These wonderful new roses have been expertly bred to give you summer-long displays, superb fragrance and reliable garden performance! Each lovely new variety will give you waves of classically perfumed, goblet-shaped, fully double blooms for up to six months each year. The roses are very similar to the Chelsea Flower Show winning varieties that are so expensive in garden centres. Give them pride of place in your borders, pots and containers or grow in a cut flower garden. Supplied as 5 premium-quality, bare-root bushes ready for planting. These wonderful new roses have been expertly bred using the latest techniques to give you summerlong displays, superb fragrance – and simply brilliant garden performance! 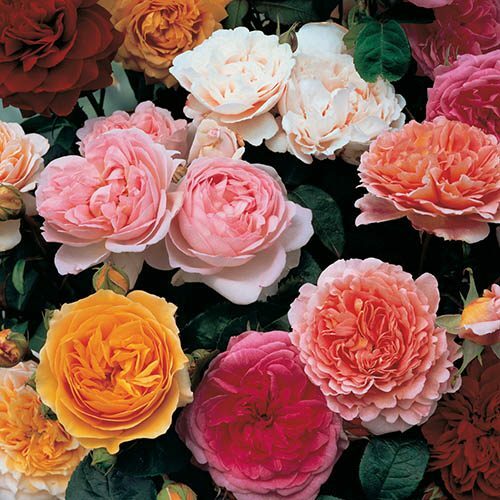 Each lovely new variety will give you waves of breathtaking fully double blooms for up to six months each year, each fully loaded with delicate petals and exquisite fragrance too. The roses are very similar to Chelsea Flower Show winning varieties that are so expensive in garden centres and some specialist mail-order suppliers will charge over £15 per bush – yet they're available here at a phenomenal price!